Today may be your last chance to see one of the best documentaries ever made in a movie theater… the way the filmmakers intended. This is one of the best documentaries I have ever seen. 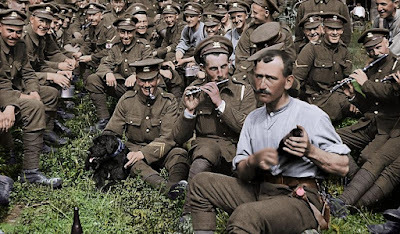 Jackson was offered 100 hours of archival film from England’s Imperial War Museums and asked to “do something different with it” for the centenary of the Armistice last November. What Jackson chose to do with that raw footage was genius in both the utter simplicity of its conception and the sheer complexity of its execution. Jackson involved the technicians at his WETA special effects workshop to restore all the film—to remove all of the accumulated grit, grime, and scratches and to transfer the film at its correct speed. The latter was no easy task since the majority of the newsreel cameras back then were hand-cranked. This resulted in a series of trial and error experiments on every filmic fragment. Jackson said he was amazed at the difference a speed change of a single additional frame per second made, but that when they got it right, it was instantly apparent. Jackson next had the footage colorized, using historical experts and photographs of actual locations that have remained remarkably unchanged after one hundred years. 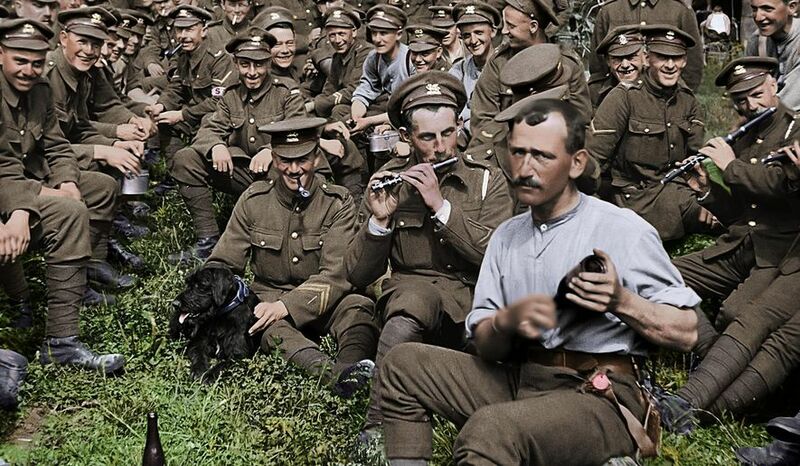 Then the footage was converted to 3-D. Jackson directed his sound crew to comb through more than 600 hours of vintage BBC radio interviews with men who served in the war, culling the movie’s soundtrack and narration from the actual voices of the soldiers who were there. 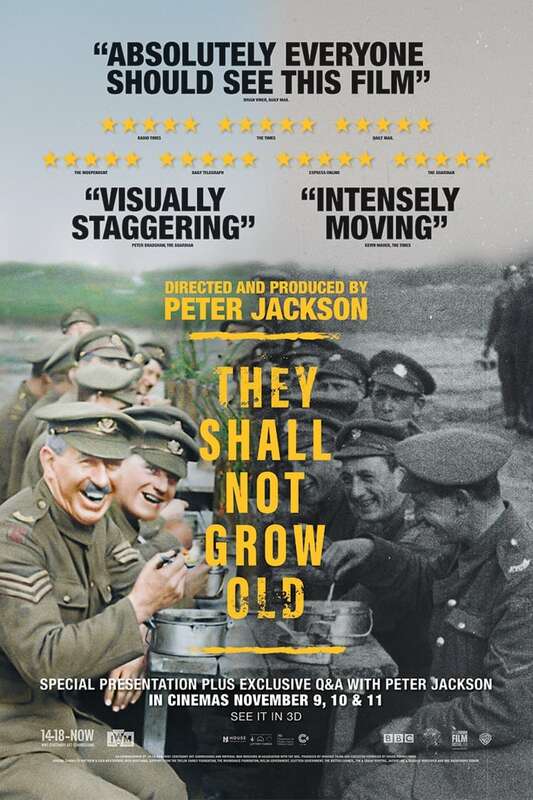 The film contains no other narration, no talking heads experts, no maps, no charts, no graphs—just real film footage shot during basic training and the war itself juxtaposed with the stories of the men who served. The organization that Jackson imposed on the material is brilliantly simple. 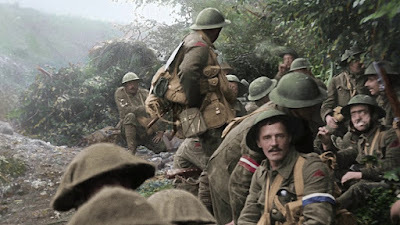 We follow young soldiers (some as young as 15 who lied about their ages in order to serve) through basic training and then into the trenches in Germany. Jackson provides a first-person journey through the horrors of this terrible, bloody war. No other film has ever portrayed the war quite like this. You are placed in the trenches and ordered to advance as your fellow soldiers are shot to death all around you. It’s the single most devastating war documentary that I have ever seen. 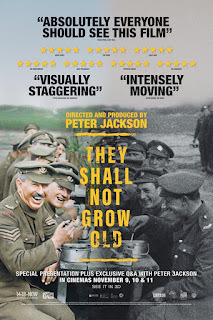 Please note: Fathom Events has decided to host one more day of screenings of They Shall Not Grow Old in theatres—and that day is TODAY, January 21, 2019. I weep that this terrific, groundbreaking film is not receiving a proper release and urge readers to seek out a screening this afternoon or tonight where you can see it as it was intended, on a big screen and in 3-D. Cancel your plans, call in sick to work, and hie thee hence to your local participating cinema! TANGENT: It shouldn’t surprise me that Jackson proves such a master of the documentary form because he once manufactured a documentary, making the damn thing out of whole cloth. Forgotten Silver is a the terrific mockumentary he concocted with Costa Botes in 1995, which purports to tell the story of New Zealander Colin Mackenzie, the “real” father of film. Featuring faked newsreel film shot by Jackson using actors, the film makes the case that the humble Mackenzie boy invented celluloid film as we know it using egg whites for the emulsion, fashioned the first practical movie camera out of spare bicycle parts, invented sound on film and color film before anyone else, and filmed an extravagant biblical epic in the New Zealand jungle years before D.W. Griffith filmed Birth of a Nation and Intolerance. It’s a hoot. When it was first shown on New Zealand television, it caused a sensation because thousands of people actually believed it. You would think that after making a fake documentary from scratch, Jackson would have found that being handed 100 hours of raw footage made assembling a real documentary so much easier! Yet another advantage of attending TONIGHT is that Fathom Events includes a bonus to accompany the screening: a half-hour “Making Of” documentary hosted by Jackson himself. As Jackson takes us through his process of making the film, it expands and enriches our appreciation for his accomplishments. The documentary alone is worth the price of admission. Last December, Thas and I were amazed and saddened by how many people in our screening left the theater after the feature and skipped the documentary entirely. 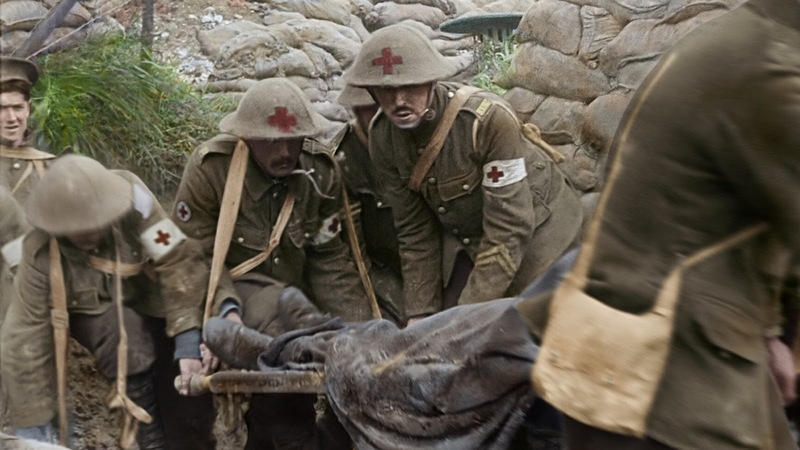 Before I saw the documentary, I had no idea the extent of Jackson’s interest in WWI, and it was one of the highlights of my movie year when, explaining how they added the Foley sound effects of a big cannon being loaded on the battlefield, Jackson reported that the sound team had used HIS cannon, one of the thousands of artifacts in his collection. Go and see this film! Then please come back and share your thoughts in the comments below? The "making of" featurette was truly remarkable. It really makes you realize that Peter Jackson is the only person on the planet that could pull this off. In addition to his weapons collection, the multitude of different uniforms he has gathered added another layer of depth and exactitude that I would not have picked up on if I had only watched the film. Also, how bout that closing song! That song had staying power— my father used to sing a version he learned in the Navy in the 1940’s! Read your article this morning then immediately bought a ticket! So glad I did and thank you for always championing the good stuff! So fortunate to actually feel the bombs in a packed theater. Not sure the footage exists but I long for a sequel about the royal air force! I went and saw this tonight and loved it. Its incredible. Lucky for anyone who has yet to see it on a big screen: Its getting a limited released in 150 markets (or more) or February 2nd per Warner Bros! I dont believe those will be Fathom events, but rather a genuine release. But I cant guarantee that. So glad you liked it. 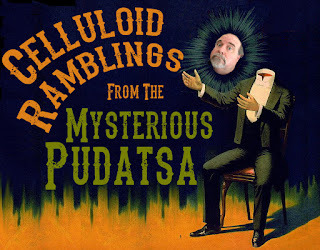 It’s terrific, and so is the news of a national release! I really appreciate this recommendation. Went out last night and caught the last 3D showing at my theater and was blown away. A true Wizard of Oz moment watching the footage transform into color. I was really astounded by the impact of seeing the faces of the soldiers clearly. Made everything so personal to hear their voices and see the lives and personalities behind their eyes. Only one other person stayed for the making-of doc at the end, but we both laughed when Peter Jackson talked about bringing out his artillery from storage to so sound effects "as you do." Very glad I saw it on the big screen and in 3D. Interested to see what they can do with a physical media release. Glad so many of you got a chance to see it. It was so good and a true labor of love. You understand how much Jackson loved this when he found that old footage of a CO reading a note. He identified the unit, then the date it was filmed, went through the archives and found the dispatch. As if that wasn't enough, found someone from the same area of England the soldier was from to do the voice. Just floored.